So I thought that once we were in the USA it would fine and dandy and that we'd get everything sorted with the bikes, have a nice day in San Francisco and then start the cycling on Sunday and balance would be restored. Oh my, I was so wrong. Staying the Matt and Rachel (our Warm Showers hosts) was fantastic. As an aside, if you cycle tour then get on Warm Showers it is a fantastic way to meet fellow tourers and it is currently saving our skin here in California. Anyway, back to Matt and Rachel, they pointed at places to see, where to get food, bike stuff and were just brilliant people. We did manage to assemble the bikes and the packing work we spent so much time on the previous couple of days paid dividends because the baggage handlers seemed to take great pleasure in attacking the boxes. 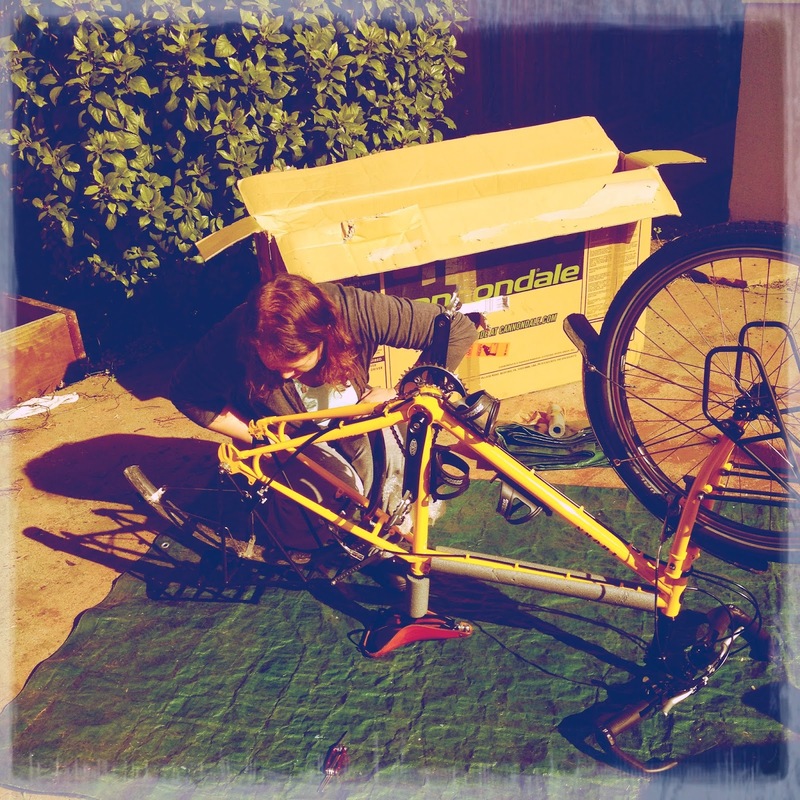 Our little outing into San Fran was not as successful as putting the bikes back together. Our aim was to head to an REI, get some food at Trader Joes, got pick up some Adventure Cycling Association Maps, visit the Golden Gate bridge and eat some amazing food. So we did eat some amazing artisan pizza. We got to the bike shop that said they sold maps, but what they forget to mention is that their maps were for Northern California and thus completely useless. This took the whole day, well the 4 - 5 hours we had in the city. We never got to the REI, never got to see the bridge and never got to stock up on supplies. 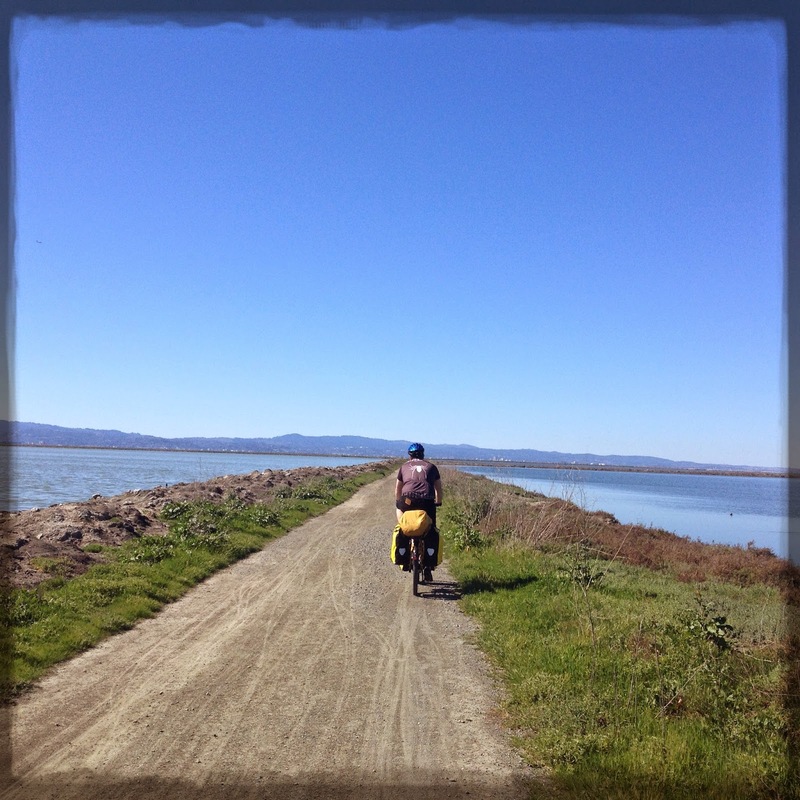 When we got home we formulated a plan to set off early and visit an REI that was vaguely on route to our first destination - Half Moon Bay; which was highly recommended by an avid cycle tourist in a bike shop we visited to double check the bikes. So Sunday came and we got up at about 5:30am to start packing and sorted out to get out early. After fixing a flat tyre and this and that we left at a much later time of 9:30am. Setting out from Matt and Rachel's was beautiful. Nice wide cycle tracks along the insanely picturesque Bay Trail. It was fairly slow going because navigating was fairly tricky and we kept stopping and talking to some folks that were really enthusiastic about the trip and kept giving us hints and tips. So getting to the REI in San Carlos took more time than we were hoping. After sorting the stuff we needed it was starting to get late but we headed on anyway. After winding up and down suburban streets we were stopped on Bunker Hill by a passerby and a cyclist asking us where we were headed. Both, separately, told us the route we were taking was a bad idea because it turned into a major highway and we were not going to get to Half Moon Bay before dark. We asked about places to camp and were told about a fire track that we could hide away on. So we headed back down bunker hill and looked to no avail for the track. In desperation we asked in a petrol station where they might suggest. The guy had a few suggestions including the school and church, but we cheekily asked if we could camp out back in the tyre storage area. He phoned his manager and after a tense time told we could stay. After all told we think we managed a really slow 40-45 miles in that first day. However things were going to get worse as we headed further south. Haha amazing last sentence there Tom!! Glad you liked the cliffhanger ending!! An REI is kinda like a GoOutdoors, so a big outdoor sports shop. The folks in there were brilliant!! Who do you think is Jessie and who is Walt?